We’ve been spotting Jaguar XJ test cars rumbling around as far back as August 2013, but these shots show the clearest view yet of the facelifted XJ, due later in 2015. Something of a belated mid-life facelift, updates are likely to be relatively minor. With the balance of JLR’s resources concentrated elsewhere, the XJ facelift is essentially a holding operation to keep Jag’s limo fresh until an all-new replacement arrives, likely towards 2018. The current-generation XJ was originally launched in 2010. What do these pictures tell us? The trade-plate wearing car in these pictures is virtually undisguised, barring camouflage strips at the lower front and rear bumpers and some light masking of the front and rear lights. Despite the stickers, it’s not difficult to make out the new front bumper. One of those new outer intakes in the lower front grille is fully exposed, as is the letterbox opening in the centre. Interestingly, a look at the badge on the trim piece between the front door and front wheelarch shows what looks to be an R-Sport badge, so it seems Jaguar will be applying its recently introduced semi-sporty trim level to the XJ. Those new bumpers are likely to be a part of the R-Sport package. A couple of elements not seen before on XJ models include the Jaguar script across the boot (current cars feature the ‘leaper’ badge alone) and black bordering rather than the usual chrome around the side windows. Part of a new Evoque-style ‘Black Pack’ exterior option, perhaps? This being a mild, cost-effective update, headlight changes lurking beneath the tape are likely to be limited to altered bulbs or internal mouldings only. What’s all that white tape on the outside about? At first glance it appears Jaguar has done an about-face and painted the D-pillar body colour rather than the blacked-out finish applied to all XJs so far, but it’s actually wearing scratch-resistant protection film. There’s plenty of protective tape all over the car, particularly on scratch-vulnerable surfaces such as the inside of the door handles and the edges of the doors. That suggests this particular car could be scheduled for publicity shoot photography duties following its road run. In addition to the white car, we’ve also snapped a more heavily camouflaged XJ with a host of camera gear clustered behind its windscreen. Particularly interesting are the two cameras pointing left and right below the main interior mirror. Although they could be part of Jaguar’s ongoing ‘virtual pillar’ technology project, a more prosaic testing purpose is likely to involve updates to driver assistance tech, such as lane departure warning or automatic emergency braking software upgrades. Of course, there’ll be a set of interior updates as part of the facelift. Whether or not the XJ’s architecture will allow JLR’s latest InControl touchscreen multimedia system to be fitted remains to be seen but either way, cabin equipment and connectivity upgrades will be high on the development team’s job list. When can we expect to see the Jaguar XJ facelift revealed in full? Although a Geneva motor show debut has been mooted, indications are that the facelifted XJ is more likely to break cover later in the year. The Shanghai show in April 2015, perhaps? After all, the Chinese market is a happy hunting ground for luxurious long-wheelbase carriages like the XJ. 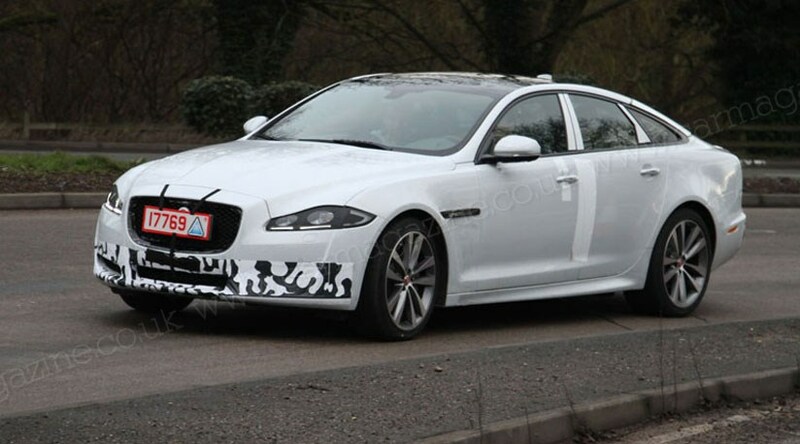 The trade-plated car pictured here is likely to be one of the first updated XJ’s to venture out of JLR’s Castle Bromwich plant, with production of the updated model probable to start in earnest following Easter.